Last week Helen and I lived the life of decadence. We dined out every night, sipped the finest wine in a chic Paris bar after a whimsical last-minute weekend getaway. We went to the cinema, to the theatre to watch a comedy and then we hiked across through the English Lakes, stopping of at a warm pub for a pint of ale and Sunday Roast. Except that of course we didn’t. We washed and cleaned and persuaded small mouths to accept “just one more mouthful” with using the currency of Peppa Pig yogurt. Frankly (and generally of course I am) though, I wouldn’t change it for the world. It’s exhausting but so rewarding as any new parent knows. Damn, I’m turning in that party bore – I apologise. I’ve been busy baking with the girls though. Well, I say baking with, more baking for. 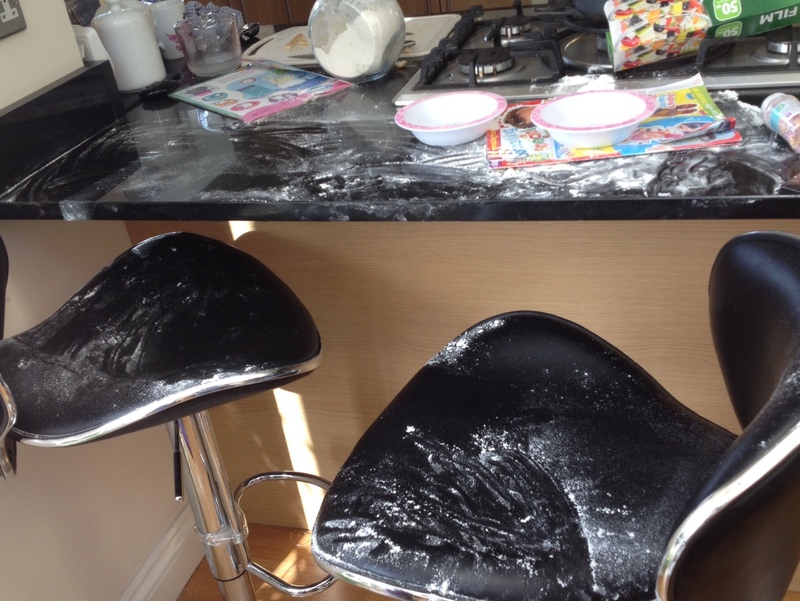 It was during this latest activity made the mistake of putting down the flour and then the unforgivable schoolboy error of TURNING AROUND FOR A COUPLE OF SECONDS. How the hell does so much carnage happen in such a small space of time? I arrived home from work the other night (having spent the day, unwittingly, with a paint print round the back of my shirt) to the normal rapturous welcome. With the little ones safely in bed, fully scrubbed, brushed and read to, I set about making this. I don’t know why I’m posting this one as it’s embarrassingly easy to do but I guess it made me hanker after our trip to Copenhagen. A city I thoroughly enjoyed. 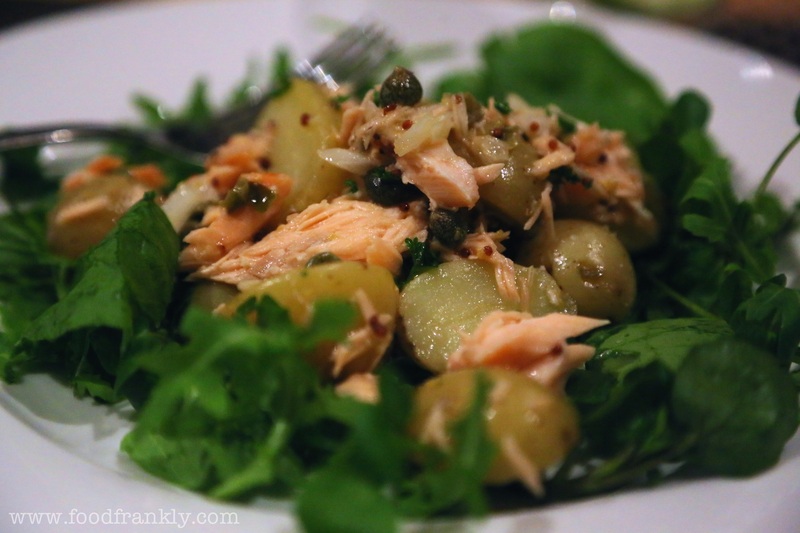 I loved the simplicity of the Scandinavian food with its focus on ‘fresh’. I much prefer hot smoked salmon for this as cured/cold smoked salmon would be too harsh for my taste. I’m also lucky to have a fishmonger down the road who hot smokes salmon daily. 1-2 tsp of chopped dill – depending on how much you like it. Halve the potatoes and boil them until just done (about 15 minutes). Let the potatoes cool until they are just warm (blood temperature). 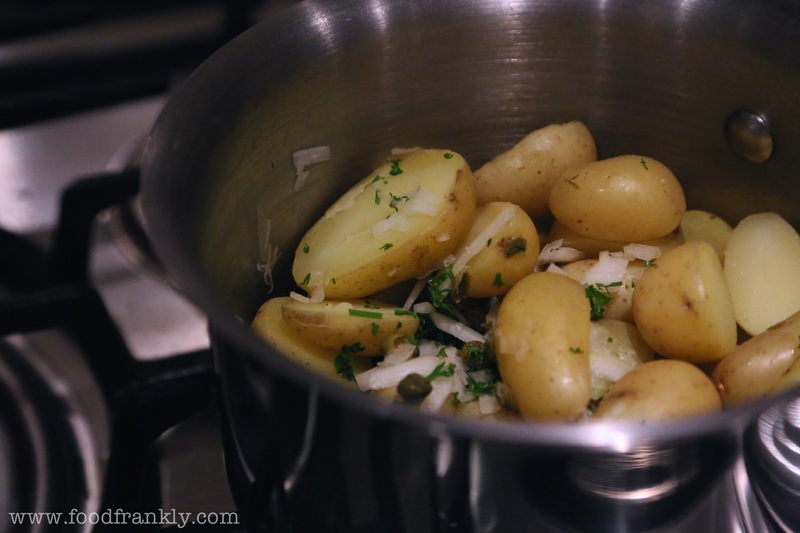 Toss the potatoes with the onion and capers and let them all come to the same temperature. 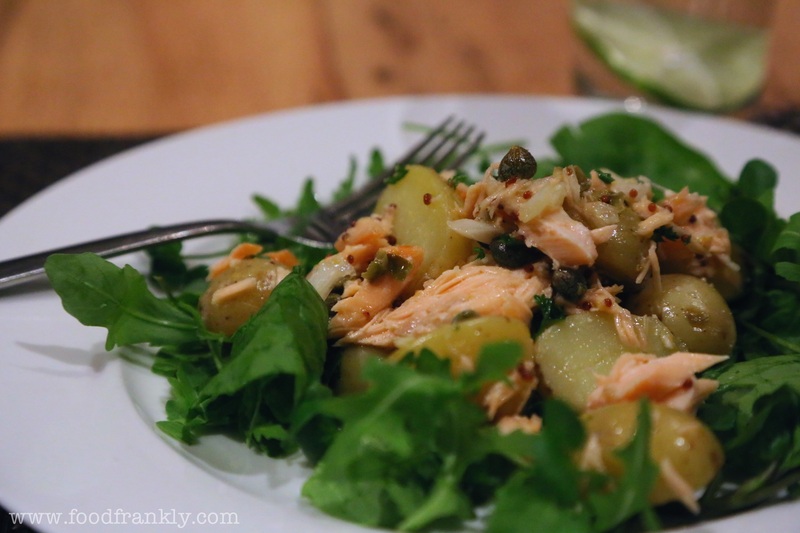 Flake the salmon and stir it into the potatoes. Mix the dressing ingredients in an old jam jar and shake well. Spoon it over the potatoes/salmon until ‘dressed’ but not ‘drenched’ Add the dill and mix well but gently so as not to break the fish or potatoes too much. Serve it all up on the leaves and relax for another day….